Why Nourished by Nature Pork? Pigs are monogastric animals, meaning they have one stomach. Their digestive systems are very similar to ours and they are innately omnivorous. They cannot survive on just grass and need to be supplemented with grain or some other concentrated energy source. Is all grain created equal? No. We feed our pigs a mixed ration of non-GMO corn, oats, flax, and various legumes. Brown’s Ranch raises all the grain that we feed our pigs directly on the farm. So not only is our grain local (more environmentally friendly bc it’s not being hauled across the country), our grain is also non-GMO, which means that no toxic herbicides, pesticides, or fungicides are ever sprayed on the crops. This closed-loop ensures us that everything we feed our pigs is grown with integrity and will contribute to their health and well-being. Do they eat anything else? Yes. Pigs definitely earned their reputation for being backyard garbage disposals. In addition to grain, our pigs get left over goodies from the garden! Nothing goes to waste from our garden and we are proud of that. If there’s ever an overabundance of produce, it goes to the piggies and they love it! 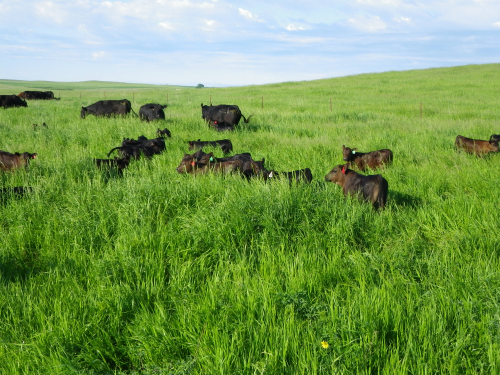 You can also catch them eating various forages and whatever else they can find that might be appealing to them out on pasture. Does this affect the taste of the meat? What contributes to the difference in flavor? Because the pigs are able to balance their own rations, they’re able to build much more robust immune systems at birth. This robustness comes from the incredible amount of vitamins and minerals that they find in their environment, and the antibodies that are transferred from their healthy moms through nursing. This, in addition to the incredible fatty acid profile that pastured pigs are able to develop, makes for incredibly tasty meat that’s loaded with nutrients for the benefit of your family. A study done in Missouri showed that conventionally-raised pork has an omega-6:omega-3 ratio more than 2 times that of pasture-raised pork. Epidemiology and dietary intervention studies have concluded that a reduced omega-6:omega-3 ratio can prevent or reverse many common diseases that plague our society today. Additionally, a study performed at the Swedish University of Agricultural Sciences showed that pigs reared outside had higher vitamin E levels and higher levels of polyunsaturated fatty acids in the intramuscular fat. Awesome! Where can I buy Nourished by Nature pork? In ordering on our website, you can either pick up at the drop-off location closest to you or have your order shipped right to your door. We are also at farmers markets every weekend. Our market schedule is listed on our website and in the newsletter for your convenience. Lastly, our most popular products are available at the Bisman Food Coop and the Prairie Roots Food Coop. What’s the most cost effective way of buying Nourished by Nature Pork? In bulk, of course! While we do sell individual cuts, we also sell ¼, ½, and WHOLE pigs directly. See our website for the ½ and ¼ prices. If considering a whole, you’ll be customizing your cuts so it’s exactly what you want. call Paul Brown at (701) 527-5573 to inquire. With buying bulk, you’re saving at least $100 with your order!